"41CE12-16, Burial AH-3" by Timothy K. Perttula and Robert Z. Selden Jr.
DECORATION (INCLUDING MOTIF AND ELEMENTS WHEN APPARENT): The upper vessel has a rim panel defined by four horizontal engraved lines with either downward- or upward-pointing excised tick marks. The vessel body has three sets of engraved concentric spirals (Suhm and Jelks 1962:Plate 59d). The lower conjoined vessel has a rim panel with two horizontal engraved lines with either downward- or upward-pointing excised tick marks. 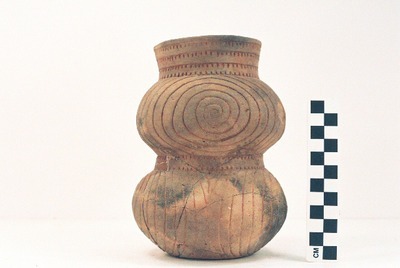 The vessel body has two sets of concentric engraved spirals, divided by upper and lower open triangles with small inner triangles. Poynor Engraved, var. Freeman conjoined globular bowls from the Jim P. Allen site.